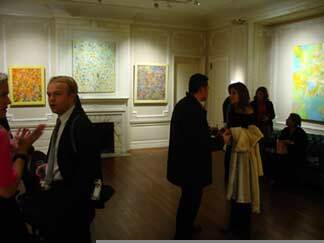 On Thursday, November 20th, the joy of being artist Alexander Klymenko was unfurled at the Ukrainian Institute of America's third art opening of the season. More than seventy art buffs gathered on the Institute's beautifully-restored third floor to nibble cheese and sip wine, as they browsed Klymenko's works, listening to the soothing sounds of Sting's explorations of Eastern music. The crowd was particularly well-dressed and good-looking, including a number of models who mingled about and posed before the artwork and the flash of digital cameras. Klymenko brought more than forty large canvasses over from Kyiv. His works are exceptionally bright and explore the interaction of primary colors or their fluorescent cousins in geometrically abstract mosaics that look like bowls of candy, painted pebbles, pysanky laid flat and patchwork quilts. Elsewhere, his subjects appear to be Japanese letters transforming into birds as they fly through clouds and bursts of sunshine. "Tres jolie," a French art collector said as he considered a bright arrangement of Australian aboriginal elements. Klymenko's works are all light, bright, cheerful and very unique. "You know it's a Klymenko right away," Tamara Shevchenko, an art producer from Kyiv, said. "I enjoy his positive style and mood, his faith in the future - there's nothing negative or depressing about it." Several people commented that Klymenko's works are reminiscent of Gustav Klimt, a turn -of-the-century Art Nouveau artist and activist from Austria. Indeed, when asked about the comparison, Klymenko admitted that he draws inspiration from Klimt's modernist mosaics. Klymenko displayed at Vienna's Kunsthistorisches Museum in 2001, where Klimt decorated the walls a century ago. "I enjoy Klimt and share his principle - my works are decorative and ornamental." Klymenko's larger canvases yearn for warmth, sunshine and the ocean; they seem best suited for large rooms and offices with lots of natural light. One can also see them as patterns for sundresses. His art has been featured in leading Ukrainian interior design magazines, but Klymenko maintains that is not his primary concern. Also a poet and philosopher, Klymenko's says his art is part of an "intellectual program" he calls "New Ethic Ecology" whose goals are humanism, creation and optimism. One fellow philosopher from Ukraine has ordained Klymenko a "priest of solar energies." Klymenko's artwork made its New York debut last June, during the silent auction of the "Because Life is Beautiful" breast cancer awareness fundraiser held at the Institute. His artwork made such an impact, the Institute decided to help organize the solo exhibit. 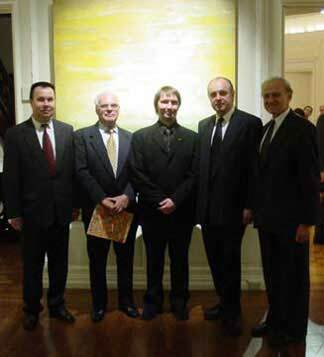 Walter Hoydysh, Director of Programs at the Institute, welcomed the artist and all present, announcing the Institute's ongoing plans of bringing prominent artists from Ukraine directly to New York's Museum Mile. Special thanks were expressed to Mykola Kravets, the U.S. Country Manager for Ukraine's Aerosvit Airlines, for transporting the exhibit from Kyiv to New York free of charge. This was the first foray to North America for the forty-year artist, who was born in the Eastern Ukrainian city of Luhansk.. His works can be found in public and private collections worldwide, including Ukraine, the United States, Russia, Israel, Switzerland, England, France, Germany and Austria. He has participated in several international exhibitions, including Pierre Cardin's "Mysteries of Eurasia." Joy is that only thing we all aspire for in this life. Innocent and childlike joy, which surpasses any most refined or perverted pleasures, which always give aftertaste of mortality and sense of doom with its egoistic and hasty obsession. Pleasures always keep the soul empty. Joy, on the contrary cures us with divine naivety and involvement with everything living on Earth, it is unlimited and immortal in the unity with Absolute. Only joy can really feed our exhausted souls. Any powerful beyond individuality and disinterested feeling of inexpressible beauty of this world turns into transcendental joy, which fills us with a special light and energy of life. As for example when you stroke kids hair, or embrace your only one, or dreams looking at stars in the sky, and suddenly you are enveloped with penetrating and sweet realization — You live! This is here and now and this is life! How wonderful this world, o Lord! The soul then filled with unearthly bliss is unusually extended for a second, united with the whole Universe, with Creator. I believe that this is the main thing, this ability of delightful admiration with the charming beauty of this world. Uniqueness of life- this is that only important thing in its complexity, which has to be transmitted by art. I believe, that all great masterpieces of music, poetry, painting are penetrated with this feeling of divinity of everything around. Exalted joy and admiration of life.